Dubai, UAE, October 20, 2018: Fashions change, yet the Golden Bridge remains. A unique piece that has gone against the trends since its creation in 1980, today it has been reinvented in six architectural versions with an original aesthetic design. They will be gradually revealed over the next few months, but the first two have been unveiled today. “The founding principle of the Golden Bridge is the emphasis on its baguette movement. Since 1980, the piece has been designed to attract all the attention”, explains J�r�me Biard, CEO. “These new versions are the perfect example of this. Titanium and DLC bring depth and modernity to the casing, which holds within it this legendary calibre with strength and elegance”. As sculptural as ever, the baguette movement once again proves both its versatility and its modernity. Here, it works alongside a structure developed specifically by Corum which embodies a geometry of overlapping bridges that evoke the most stunning masterpieces of human genius, notably the suspension bridges like the Golden Gate or the Brooklyn Bridge. It is in total consistency with Corum's artistic universe, its roots in La Chaux-de-Fonds (where Le Corbusier was born), its historical attachment to art and its capacity to break free from watchmaking codes. The piece is available in two versions: white gold and pink gold. This variation is found on the movement, the hands, the flange, the crown and the screws which maintain the structure of both sides of the baguette movement. The rest of the covering is black. 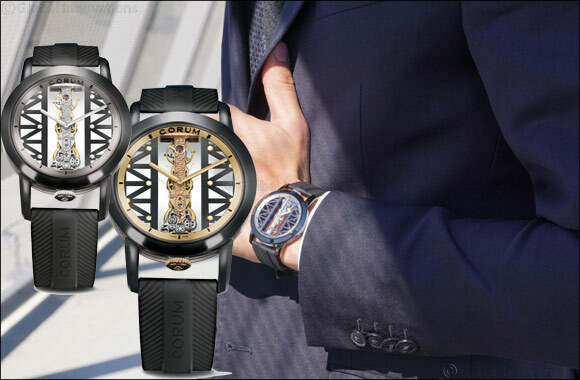 It's the first time that Corum has conferred a black rubber bracelet, veined and engraved with the brand's name, upon its Golden Bridge.